Steelmans UK offer a full support service including a regrind, refurbishment and repair facility in the UK. We are able to regrind both Steelmans supplied tools along with tools from other manufacturers. 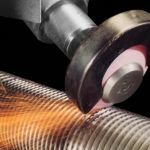 Steelmans prides itself on a fast and efficient turnaround for all sharpening services. A correctly sharpened broach ensures tool accuracy, adds life and results in lower costs to the customer. We are able to analyze your tools and components to provide recommendations for the most cost-effective way to improve performance. We also offer the repair of broaching tools, for example, the rebuilding of broken teeth and the repair of broken pull/tail ends. We can even repair some broach tools that have been broken into sections. Along with broach regrinds we offer the sharpening of other cutting tools such as hobs or gear shapers. We will get your tools back into production, on time and on budget.